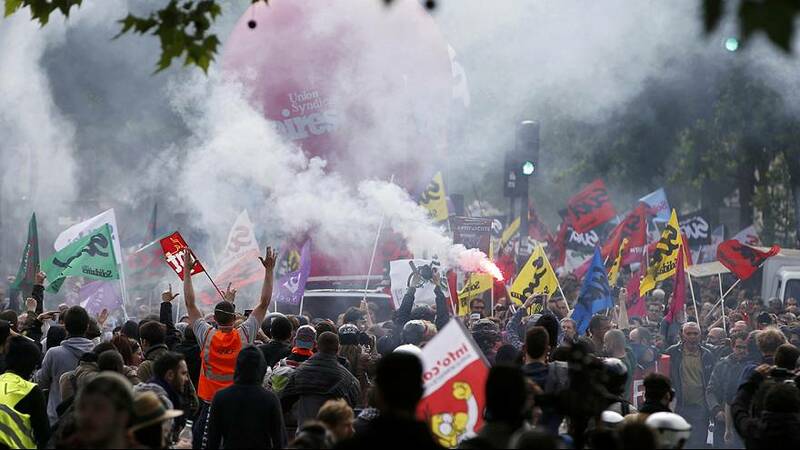 France has been hit by another day of strikes and protests against controversial labour reforms. Public transport, oil refineries and fuel supplies, nuclear power stations… all continued to be disrupted on Thursday. The state rail company SNCF said fewer trains were affected than during a similar strike last week. Estimates for the number of protesters on the streets mirrored the gap between the government and its opponents: 19,000 in Paris said the authorities; 100,000 was the unions’ figure. Prime Minister Manuel Valls has insisted the government will not withdrawn the law and will break up the blockades. He has hinted there could be some tweaks to the reforms but not on any of its key measures. “We have a prime minister who remains self-assured, saying the famous article causing most problems can be changed a little, but without withdrawing his approach. So the answer on our side is no. As long as the Prime Minister remains so self-righteous, the conflict will last,” said Jean-Claude Mailly, leader of the Force Ouvrière union, speaking from the cortege in Paris. “More than 70 percent of people are in favour of the bill being withdrawn, that shows – contrary to what I hear from official sources – that we’re neither a minority nor a sect nor whatever,” added Philippe Martinez, Secretary General of the CGT union. The government hopes that giving companies more flexibility over rigid employment regulations – in areas such as overtime pay, leave and the 35-hour week – will encourage firms to recruit, reducing high unemployment. It has been described as President Hollande’s last throw of the dice before next year’s elections. Opponents doubt the changes will bring the required employment boost and fear more job insecurity. Six unions back the CGT, the main union organising the protests. Several more arrests were reported as again clashes broke out in Paris and other cities.